One definition of Elixir is "that which brings forth life," and that is exactly what Alex has done for the last twelve years all over North America and internationally, in over a dozen different countries. He is a favorite of the Vancouver Convention industry and has been the entertainment high-light of countless corporate events. On the Festival and Fair circuits, Alex is renowned for his ability to draw huge crowds of enthralled onlookers. He's also known for playfully involving some of those audience members in ways that are both amazing and highly entertaining. "He truly wowed people with his talent and spirit! Alex's exhibitions and showmanship considerably added to the successful atmosphere of our event"
Alex was born and raised in Nova Scotia. A rambunctious and hyper class clown who got a taste of theater with a local puppet company, Alex was a performer before even he realized it. 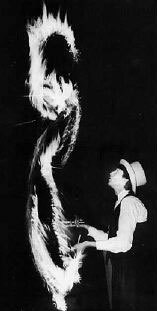 He saw his first street- performing juggler on a trip to California when he was nineteen. Inspired by that show, Alex started practicing...Within a few years, he was a competent technical juggler. After honing his skills on the streets of Vancouver he performed his first stage show at a rowdy, drunken stag party. Fortunately better gigs followed. Twenty years later, Alex is an award winning, internationally acclaimed funnyman, event consultant and circus instructor. He lives in British Columbia, Canada with his family, and still loves his job! Noteable Entertainment & Events is a Vancouver based booking agency, party rental, entertainment services and event production company. If you are interested in booking Alex Elixer please contact us.